I’ll be honest—this recipe is a little outside my wheelhouse. I wouldn’t have seen a pin labeled “lime curry chicken” and thought, “Oh man, I’ve gotta try this!”. I’m a sucker for authentic Italian cuisine, Southern comfort adaptations, that kind of thing. My sister, on the other hand, gravitates toward flavors like curry, cilantro, lime, and the like, flavors with Asian or Mexican inspirations. It’s interesting how we can both have grown up eating the same food and diverged on very different flavor paths as adults. So I was visiting her over the winter break and we whipped up this little recipe for dinner. 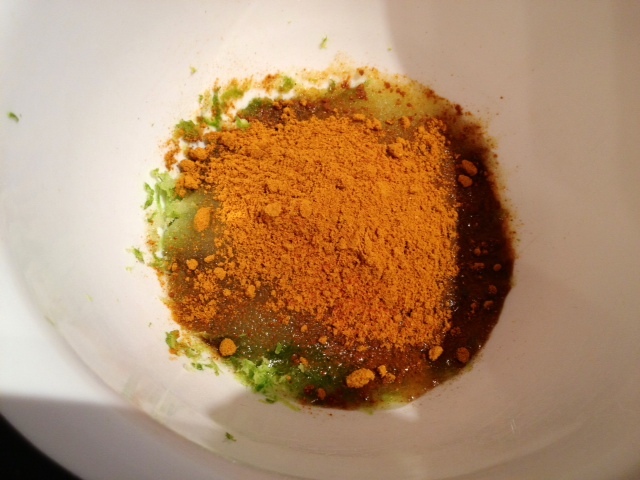 The actual prep time didn’t take long at all, simply some grating and whisking together ingredients. But I would recommend letting the chicken marinate in the sauce for a half-hour or so before cooking, lets these flavors really soak in. This chicken was so flavorful and yet all of the flavors worked so well together. And it was so moist! It’s actually called “lime coconut chicken”, but to me you couldn’t taste the coconut milk flavor (which is totally okay in my book) and you COULD taste the curry. So I made an executive decision. We served with lime cilantro rice on the side, but it would be great with regular rice, noodles, or regular side dishes and bread. The original recipe calls for it to be grilled (which was delicious), but I don’t have a grill and you’d be fine sauteing in a pan or even (if necessary) baking. I think saute is probably better than baking, but either would work. 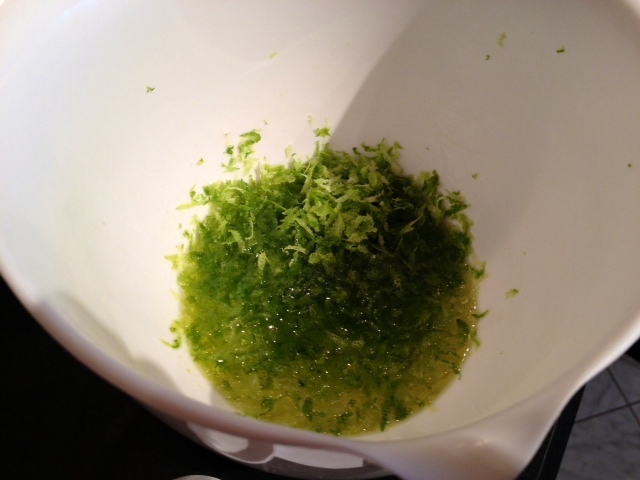 Zest the lime into a bowl. Add all the rest of the ingredients (oil, spices, soy sauce, coconut milk) except the cilantro and extra limes to the bowl. Stir or whisk all the ingredients together and pour in a giant ziploc bag (or big tupperware container) with the chicken. 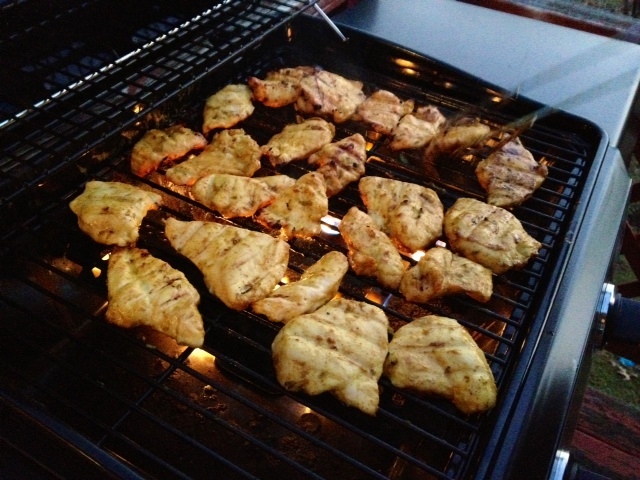 If grilling, grill as desired (don’t overcook and dry them out). If baking, I’d recommend baking at about 400 F and pouring all of the sauce over the chicken while it bakes (keeps it moist and really soaks the flavor in). If sauteing, cook in a pan on medium with a little olive oil, cooking at least 3 minutes on each side before turning (to sear and lock the juices in). All done! 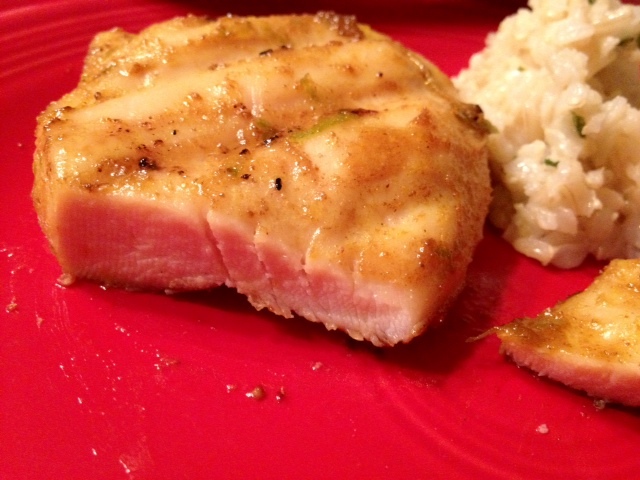 Juicy, flavorful, delicious chicken, and ready so quickly! 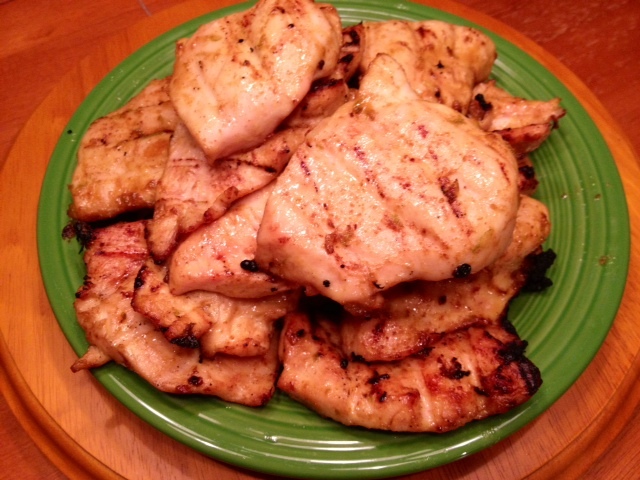 One thing to note—the recipe says to use the leftover marinade to make a sauce for the chicken. We omitted this step because there wasn’t much left and because having the raw meat juice in the marinade kind of freaked us out. And we were lazy. Optional pre-step: Depending on how you like your chicken (we didn’t do this), you can pound the chicken to a thinner cut. 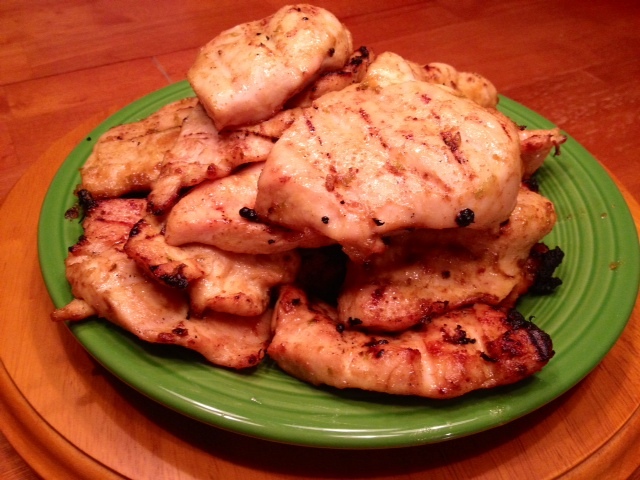 On the thick side of the breasts, slice the chicken breasts almost in half horizontally, then open each like a book. Or, place a chicken breast between two pieces of plastic wrap, wax paper or inside a large, open, Ziploc bag, then use a small heavy pan, bottle, canned good, or smooth meat mallet to lightly pound out each breast into even thickness. Mix all remaining ingredients in a bowl except fresh cilantro and limes. 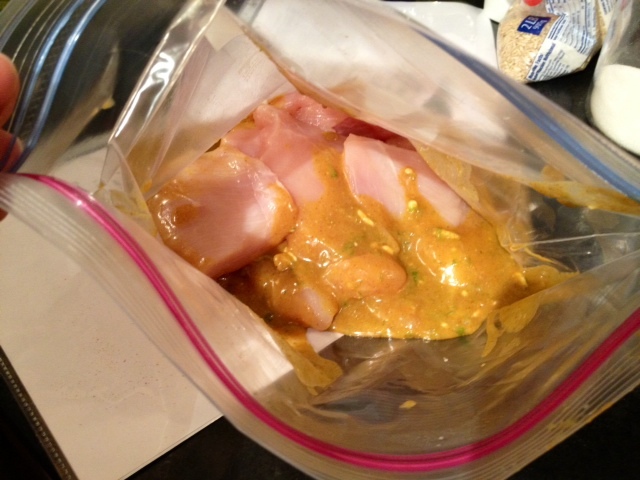 Add the chicken and marinade to a large bowl or ziploc bag and chill in the refrigerator for up to two hours. [NOTE: we skipped this step because 1) we didn’t have lots of marinade, and 2) using the marinade with all the raw meat juice in it kind of freaked me out; your call] Once you’re ready to cook the chicken, remove each breast from the marinade. 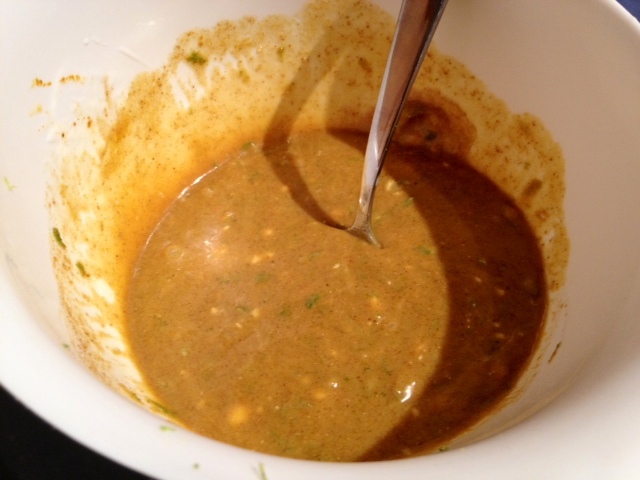 Pour the marinade into a small saucepan and bring to a rolling boil. 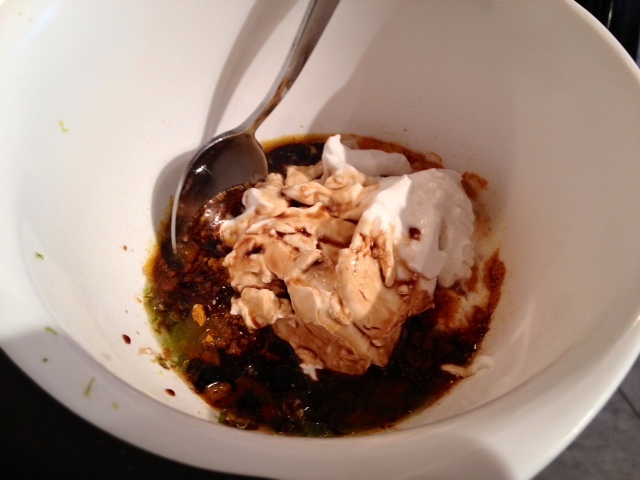 Boil continuously for at least 2 minutes, stirring occasionally so it doesn’t burn. In a heavy skillet or grill pan, heat a splash of oil over high heat. My sister grilled them on a real grill, but I don’t have one. Cook the chicken in batches to prevent over-crowding the pan. Also, excellent executive decision regarding the recipe name. I’m going to start calling it Lime Curry Chicken as well, since I also cannot taste the coconut milk flavor.